DETROIT, MI--(Marketwired - Oct 6, 2015) - On October 11, Herman Moore, former Detroit Lions' All-Pro wide receiver, will be the featured guest on MI Healthy Mind, a 30-minute interview show on TV 20 Detroit that airs each Sunday at noon. Topics discussed each week include special guests who talk about a variety of issues affecting people's mental and physical health. Moore will talk about ways in which his childhood background in a disadvantaged area gave him insight to challenges that many youth experience. Viewers will also hear how Moore has combined his career as an NFL athlete and businessman to serve as a role model and mentor for young people, encouraging healthy lifestyles. Moore is an ambassador for the NFL Detroit Lions Fuel Up to Play 60 program. Moore, who was the Lions' first-round draft pick in 1991 from the University of Virginia and retired from the NFL in 2004, has kept his home base in metro Detroit. MI Healthy Mind is produced by Team Wellness Center, a Detroit-based comprehensive provider of mental health services, and hosted by Elizabeth Atkins and Michael Hunter. They interview experts who work in the areas of mental health and recovery, as well as people who have endured and triumphed over abuse, addiction and other difficulties. MI Healthy Mind, which began airing in April 2015, has covered a variety of topics including human trafficking, domestic abuse, drug and alcohol addiction, and a variety of issues impacting both mental and physical health. 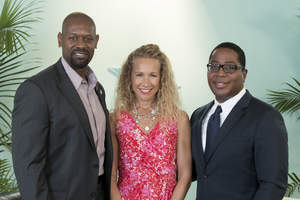 According to hosts Atkins and Hunter, viewers will not want to miss Herman Moore who has demonstrated his commitment to the local community in a variety of ways. "I love Michigan. Everyone has been wonderful here, and I enjoy having the opportunity to help our youth make good choices," said Moore. Team Wellness Center encourages MI Healthy Mind viewers to submit topics of interest to Listening@MIHealthyMind.com. For more information about opportunities for guest appearances and advertising, visit www.MiHealthyMind.com. Team Wellness Center provides comprehensive behavioral services and physical care for individuals with severe and chronic mental illness in southeastern Michigan. The Center's clinics in Southgate and Detroit's Eastern Market offer psychiatry, primary care, social work, housing and employment assistance, substance abuse treatment, faith-based treatment, and more. All mental health care services, programs and groups are provided using the person- centered planning process with individualized treatment plans available for both short- and long-term mental health problems. Established in 2002, Team Wellness Center is an accredited provider of the Commission on Accreditation of Rehabilitation (CARF) since 2003. For more information, visit www.TeamWellnessCenter.com or call 313-396-5300.